The ever-so nutritious fruit has an amazing taste and a host of trivia that has a superb flavor. Highly nutritious, apricots contain very few calories - about 50 Calories, in just about 3 Apricots, weighing 100 grams each. A glass of Apricot Juice may help to reduce the signs of aging on the skin, ensuring a lasting youthful completion. Rich in Calcium, Apricots ensure bone health and save you from brittle bones especially during old age. Any form of environmental pollution can be taken care of by munching on a few apricots ever so often. 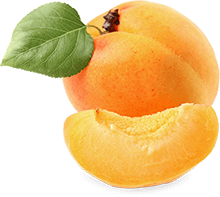 The apricot fruit is naturally, yellow or orange. If it has a reddish shade, it has been chemically preserved with sulphur di-oxide, and is harmful to the body. Beware!